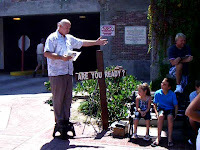 This past Sunday afternoon at the San Juan Capistrano train station was an afternoon of firsts. It was the first time out for my newly built "Are You Ready" cross. It was the first time I had witnessed to somebody who is intoxicated. But, the biggest first by far was when Dave broke the sound barrier and stepped up onto the box and preached for the first time!! The day before, at the Huntington Beach Pier, I challenged Dave to write out a gospel message on a sheet of paper and simply read it aloud at the train station. He took me up on my challenge and preached a beautiful gospel message. It was an honor to be there for this first! Dave, job well done my brother! We will be back at the San Juan Capistrano station again this Sunday from 12pm-1pm so come join us if you are able. I know you will be blessed! Click here if you don't see the embedded video. It is two o'clock in the morning and a sound startles you out of your sleep. You jump out of bed and notice the heavy smell of smoke in the air. Fearing the worst you start yelling for your wife and kids to get up and get out of the house. The family is now gathered on the front lawn together in their PJ's and you realize that it is not your house that is on fire... it is the neighbor's house. You can see the flames through the first story windows and thick black smoke is billowing out of an open window. You see both cars in the driveway and you notice that there are no lights on and it is obvious that they are still in the house, most likely still asleep. You must now decide what you will do - quickly! Will you stay there, grab a lawn chair and watch as the house is consumed in flames? Will you simply call 911 and step back as a spectator? Or, will you run over to that house and start pounding on the door and making as much noise as you can to awaken your neighbor? You realize that, as a loving neighbor, you really only have one choice, so you start running toward their house. How many methods do you have at your disposal to awaken them? You can holler, knock, pound, ring the doorbell, pound the walls, bring out a bullhorn -- whatever it takes!! Every day 150,000 people die. The bible says that it is appointed for man to die once and after that the judgment. God's standard with which He will judge is His moral law, the ten commandments. If you have broken one you have broken them all. Ever lied? Stolen? Taken God's name in vain? Hated somebody (hatred is murder according to Jesus)? Lusted (lust is adultery according to Jesus)? Face it, we have all broken God's laws and are deserving of Hell. You, me, our neighbors, those living in our communities... we are all in the same boat. As born again Christians we know that there is hope however. God the Father sent His son, Jesus Christ. He was born of a virgin, was fully God and fully man, and lived a perfect sinless life that we could not live (He's God and we're not!). At the end of His earthly ministry He suffered (flogged, crucified, was more marred than any other) and died on the cross, taking the wrath of God upon Himself that we deserved. We broke God's law but Jesus paid our fine in His life's blood. The bible commands us to repent and put our trust in Jesus Christ alone for salvation. Turn from sin and turn toward God, put your trust in Jesus alone, and your fine is paid - in FULL. That is the good news of the gospel. The flames are licking at the curtains. The smoke is billowing. What tools do we have at our disposal to awaken those who are perishing in sin and don't even realize it? Gospel tracts? Preaching? One-to-one conversation? Letters? Email? Facebook? Twitter? Signs (good, biblical ones that is)? Banners? 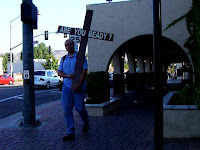 Several months ago, a dear brother in Christ, Tony Miano, wrote a blog post about standing at a busy intersection in his neighborhood while holding a wooden cross with the simple question written on it, "Are You Ready?". As soon as I read his article I knew that I had to do the same. Since he wrote that article others have also been stirred up to do the same (Paul Latour, Wayne Dawg). The testimonies keep rolling in from these faithful heralds of the gospel. People will walk up to them and ask them what "Are You Ready" means and this provides the opportunity to share the gospel message with those who may not get to hear it any other way. I have built my cross (see the pictures below) and am ready to deny myself, pick it up, and follow Jesus. To God alone be all the glory! Please pray for me. Wednesday afternoon, before church, I will stand at the corner of Ortega and Camino Capistrano in San Juan Capistrano with the cross. I am nervous just thinking about it but the flames are licking at the curtains and I will do whatever it takes to wake some up.